Few players have provided more important plays for the Steelers the past few years than Ben Roethlisberger and Antonio Brown, and they were at it again today. Roethlisberger, their Pro Bowl quarterback, had thrown two touchdown passes, one of them to Brown, who fought through a defender to reach the end zone. He had more than 300 yards passing and he led his team from behind into a fourth-quarter lead against the Dallas Cowboys. Brown, their MVP last season and Pro Bowl returner, took one punt back 29 yards and led the Steelers with eight receptions. However, both players made critical errors in the fourth quarter and overtime, each blaming themselves for the Steelers 27-24 loss, their fourth in the past five games that dropped them to 7-7, yet somehow still quite alive for a playoff spot. 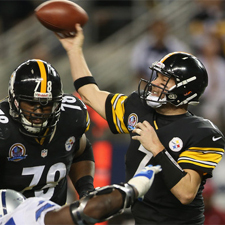 But Roethlisberger and the Cowboys’ Tony Romo put on passing clinic and good quarterback play after a sluggish first quarter in which the Cowboys led 3-0. More from Mr. Bouchette here.